Racing under the hot summer sun, it was a day full of on-track action at Round 2 of the 2016 GT Radial FlatOut Race Series (FORS) held last April 9 at the Clark International Speedway (CIS). It was also the biggest turnout this season with 95 drivers competing in the Time Trial challenge and Grid races. 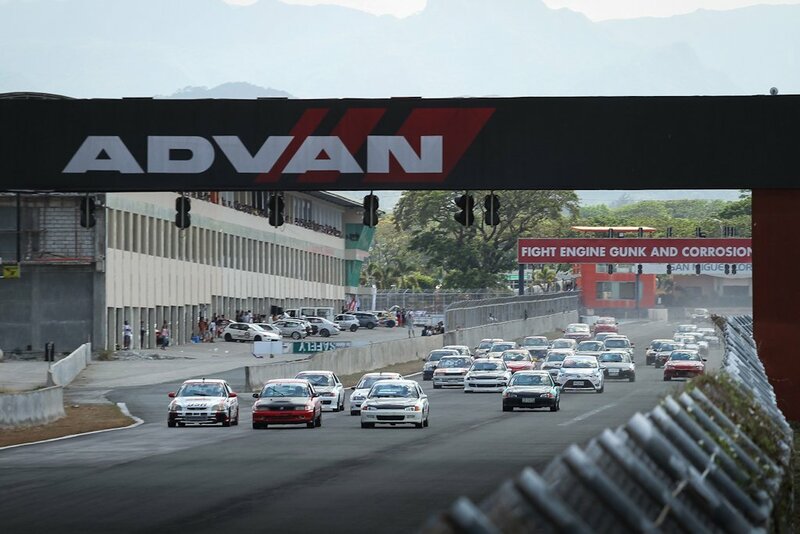 The country’s premier grassroots motorsport event ran the full 4.2-kilometer course where high temperatures pushed both man and machine to heat-induced exhaustion. The Automobile Association Philippines (AAP) was also present on track to guide both the organizers and racers. Of quickest driver of them all was JC Baguisa of the JCT-Blanche Racing team. The racer from Cabanatuan City set a blistering pace in the time trials to take 1st place in Bracket A. He then qualified on pole position in the #696 Honda Civic Hatchback and fought a hard battle against other drivers in the top Grid bracket, defending his position to take the win. The top-seeded Bracket A saw JC Baguisa achieve the a fastest lap of 2:10.421. He was 3 seconds clear of his closest rival, Eduardo Suiza in the Competition Clutch Honda Civic EG hatchback who posted a 2:13.101 lap. Meanwhile, famed car tuner Mato Tan of Matonetics came in 3rd with a time of 2:15.067. In Bracket B, the competition was so fierce that the top three finishers were within a tenth of a second apart. Christian Go finished 1st with a 2:16.064 lap in the gray JCT-Blanche Honda Civic Hatchback. Gerald Loy, who clocked in a close 2:16.201, had to settle for 2nd and Sydney Sarmiento completed the podium with a time of 2:16.218. For Bracket C, Joey Howard got the podium with a 2:21.101 run. Driftmob’s John Boban managed a 2:21.237 lap in a Toyota Soarer for 2nd place and James Santiago’s 2:21.726 lap earned in 3rd. The heavily contested Bracket D saw Jonnie Pineda, Arturo Pasao, and Polo Bautista take home 1st, 2nd, and 3rd, respectively. With 12 entries in Bracket E, Raymond de Pano took home 1st place for the second time in row, coming in with a 2:21.220 lap. Close behind were Erwin Manaog in 2nd and Lloyd Puno in 3rd . Anthony Richard Lanting’s 2:36.424 lap put him in 1st for Bracket F. Robert Tan won 2nd with his 2:37.493 lap and Lars Alonzo had a 2:37.511 time for 3rd. The fastest in Bracket G was Karol Jose with a best time of 2:42.101. 2nd and 3rd places were awarded to Ryan Despuing and Mark Pascual, respectively. Bracket R, otherwise known as the open class, was topped by Suiza driving his Lancer Evolution and taking the fastest time of the day of 2:09.070. Baguisa and Willie Torres followed in that order. Finally, the winners in the support classes The Perfect Lap and Grupo Toyota were John Boban and Greg Suing, respectively. Grids A, B, and C were all run together forming a big 25-car grid. Top qualifier and Bracket A winner JC Baguisa lost his pole position early in the GT Radial Grid A race. This allowed Rafael La’O and Eduardo Suiza to get ahead. A scrappy drive from Baguisa allowed him to overtake Suiza, then La’O from the inside of Turn 1 midway through the race and never looked back. Baguisa took home a well deserved win in the 8-lap race, followed by Suiza in 2nd and La’O in 3rd. Behind them, there was massive 9-car battle in the Smart Fuels Grid B race. Christian Go strongly defended his position and managed to pull away a 5.197 sec lead to take 1st place. Following behind were Gerard Loy and Baguio City’s Gabby Sohu who traded positions at almost every lap. Loy would cross the line in 2nd while Sohu in the PAGCOR/Zenium/Gerco-backed Honda Civic EG Hatchback earned a well-deserved 3rd place. James Santiago dashed to victory in the Competition Clutch Grid C race over 2nd placer Lesley Tuazon and 3rd placer Vanni Garcia. Even bigger was the combined Grid D and E that had 35 cars on the line. Buddy Club Grid D saw the biggest line-up with 20 drivers fighting for a win. Sherwin Bargos once again bagged 1st place in the 7-lap race. Unfortunately for Polo Bautista who should be in 2nd, he broke out of his bracket time relegating him to 9th place after penalties. Alex Perez and AC Gutierrez were both handed the same penalties, awarding 2nd and 3rd places to JP Pacres and Franklin Ong, respectively. Meanwhile, Anthony Richard Lanting won 1st in the Works Bell Grid E with RJ Lanting in 2nd and Jack Saguilayan in 3rd. For Round 3, the FlatOut Race Series (FORS) heads back to the Batangas Racing Circuit (BRC) this weekend.